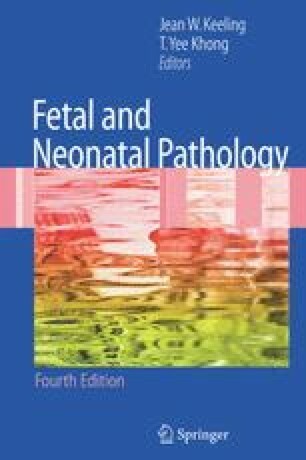 The importance to clinical practice of information obtained by adequate necropsy examination of babies dying in the perinatal and neonatal periods (Alberman 1980) is often not fully appreciated by histopathologists providing a biopsy-oriented service for adult patients. Examination of stillborn infants has been particularly neglected. This is probably related to negative expectations concerning the likelihood of making specific diagnoses. Necropsy information is of practical importance at three different levels of clinical practice. First, it is important to the family of the dead baby and to the clinicians involved in their care. Second, necropsy findings are necessary for adequate audit of unit policies and practices. Third, data derived from postmortem examination make an important contribution to regional or national statistics by complementing clinical data collection. Some necropsy data are appropriate to all three levels of enquiry, but each requires answers to specific questions.